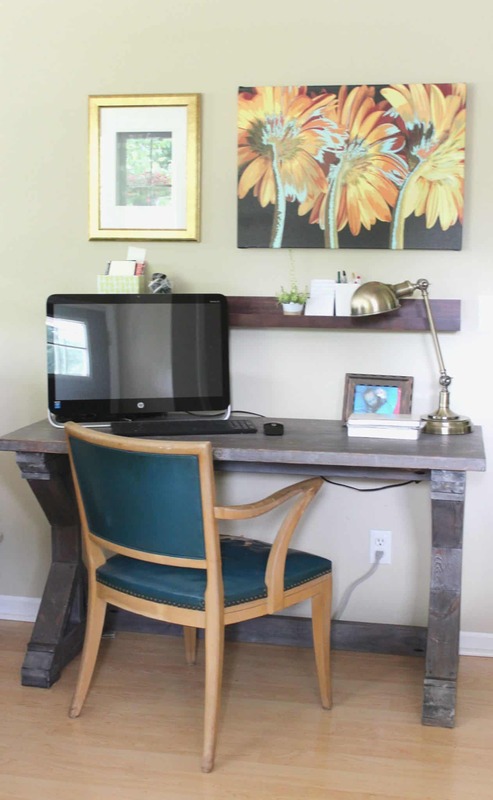 For anyone new to Flawed yet Functional, DIY and home projects are my happy place. It is therapeutic for me to paint a room. I get great satisfaction sewing a Roman shade for a window. Making wood beautiful with my own two hands is downright fun for me. It gives me great joy to make my home beautiful with my own elbow grease. Doing and sharing these projects though are two very different things. It takes a lot of bravery to share home projects when I’m not a professional, an interior designer, or anything like that. I’m a reader and a life-long learner who likes to work with her hands. This post is me being brave. I’m not a trained in upholstery, but I like to learn to create beautiful things with my hands. I love Myquillyn’s tagline: It doesn’t have to be perfect to be beautiful. I couldn’t agree more. 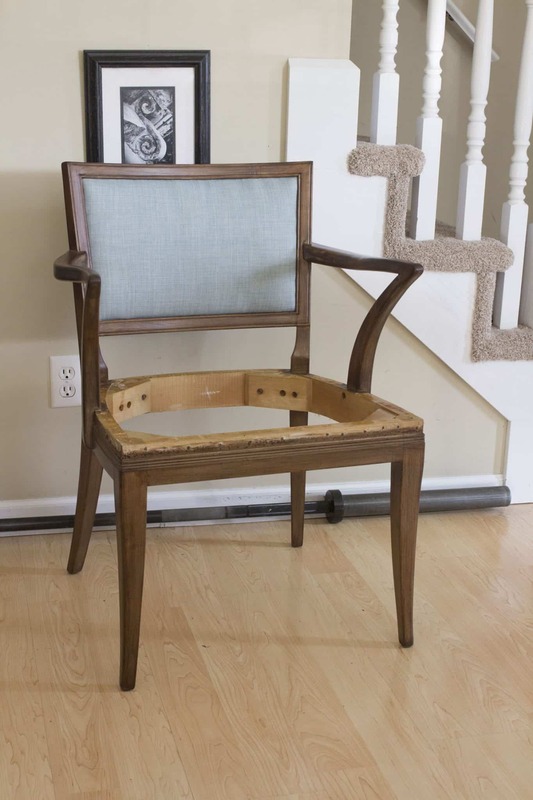 Let’s be brave together and re-upholster a chair! Quite a few years ago, I purchased this wood side chair off Craigslist for the desk in my home office. The seat of the chair was ripped when I purchased it so the plan was to reupholster it at some point. Although I loved (and still do!) the mid-century modern lines of the chair, I wasn’t fond of the blond wood. After I removed all of the old upholstery, I gave it a couple coats of Minwax Special Walnut and a couple coats of polyurethane for durability. 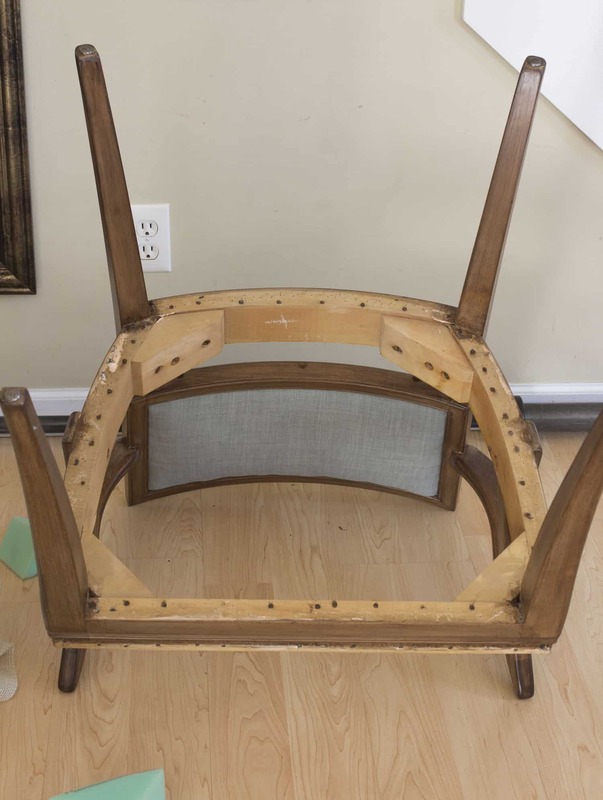 Since I put this project off for years, I mean YEARS, and I’ve worked on this project in stages, I don’t have good photos of dismantling the chair and staining the frame. The removal of the old upholstery and re-staining took place in early 2017, and then I let the cost of new foam for the seat allow me to procrastinate with finishing the chair. I’m really good at procrastination when I’m not feeling confident in a project. So there my chair sat for months and months while I “saved” to buy the foam and other materials for the seat of the chair. I finally purchased the rest of the materials for the seat of the chair a couple weeks ago. The purchase only occurred because I happened to check the Jo-Ann’s coupons to find I had a 50% off one cut of fabric which included foam. Score! Guess how much it cost me? I should tell you I didn’t just buy foam. I bought the dust cover, burlap, burlap webbing, nail heads, AND the foam for $55. This chair has been sitting unfinished for over a year for just $55 (or over 7 years if you go back to the original purchase!). I finished the chair back insert in the summer of 2017, and I failed to take any pictures to document it. So this is the starting point for finishing the chair seat. The seat of the chair only has the wooden frame, nothing else. I took pictures of how the chair was put together as I stripped off all the old upholstery. I followed the same pattern, method, and materials to build the new seat. I’m not an upholstery expert, so I don’t know if I’m doing this right, but I think it will turn out sturdy and comfortable. That is a good enough result for me for my first upholstery project! 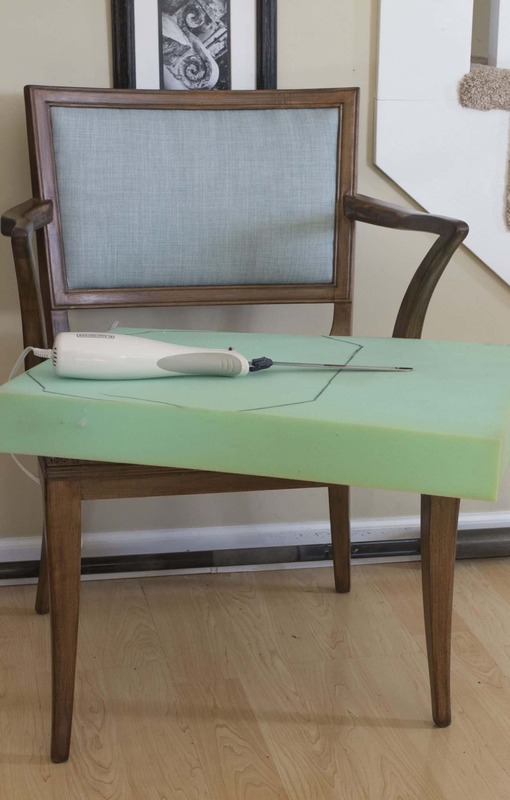 Before beginning to staple anything to the frame of the chair, get a pattern of the seat shape traced onto the foam. 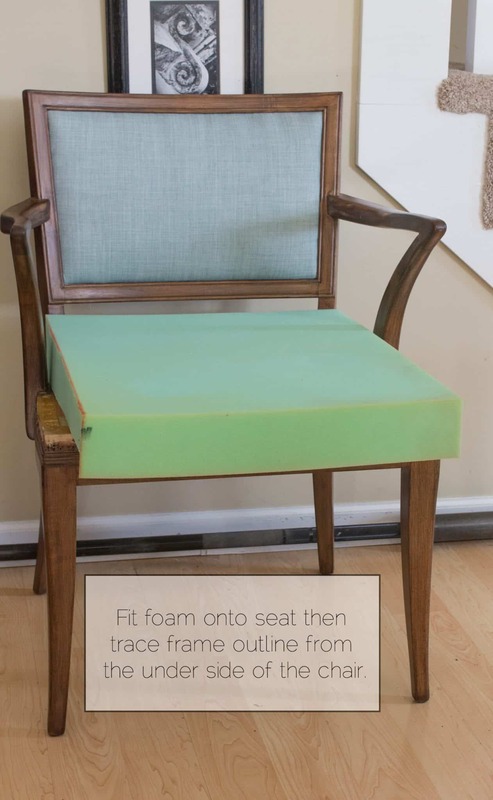 Lay the foam piece on the seat of the chair as snugly as possible without buckling the foam piece. Then trace around the inner side of the underside of the frame to mark the shape to cut the foam. Does that make sense? Kneel down and trace from the bottom of the chair. It is a little awkward, but it is a quick thing to do. Cut the outline you just traced using an electric knife or a serrated bread knife. Don’t try scissors or a flat knife, it will tear up the foam. If you have access to an electric knife, it will cut through the foam like butter. Please be careful not to cut yourself or your floor in the process! Before moving on to assembling the chair, put the foam into the frame of the chair to make sure it fits. Make additional adjustments as needed. I kept my foam insert tight, but I did have a gap at the back of the chair. To fix this, I ended up cutting a thin piece of foam to fill in this gap before putting on the batting (see the Cut the Batting step below). When I removed the original upholstery, there were large gaps between the foam and the seat frame, and these gaps were not filled with anything but air! So I don’t necessarily think every square inch of the frame needs to be filled with foam, but it seemed like the right thing to do, so I went for it. Now it’s time to start putting the chair back together. Start from the bottom up, except leaving the dust cover until the end just in case something needs to get removed. 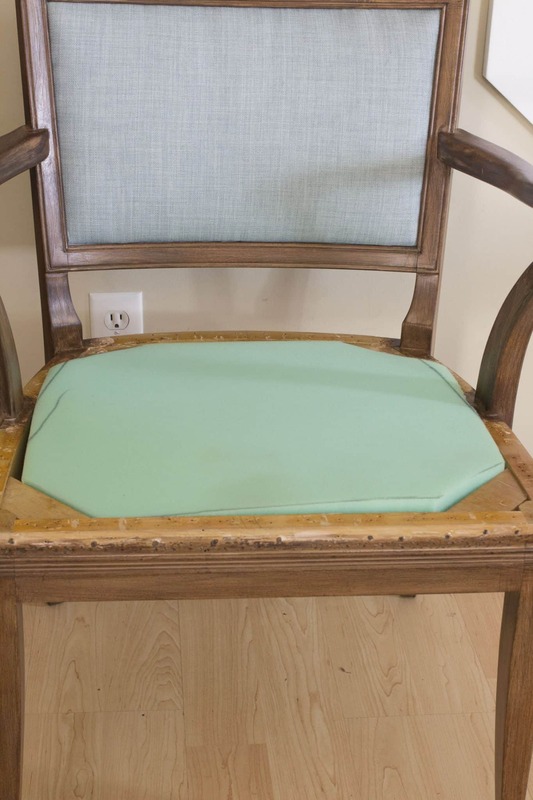 Turn the chair “on its knees.” With the back facing you, tip it forward so the bottom is exposed. This makes the stapling of the burlap much easier. I used 9/16″ long staples (long!) because this layer is structural. It will partially hold the weight of the person sitting on the chair. 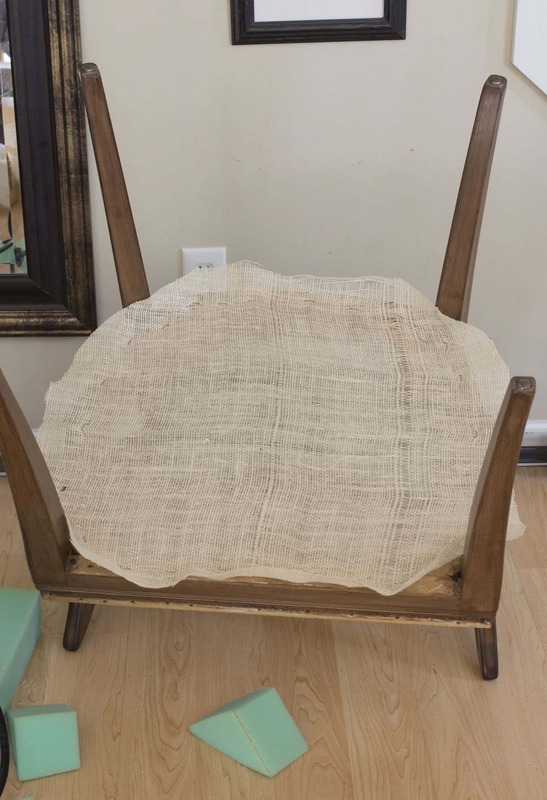 I laid my roughly cut piece of burlap on the bottom of the chair then stapled in a north/south/east/west pattern to keep the burlap centered and taught. Continuing working around the chair bottom in this pattern (N/S/E/W) pulling the burlap taught as you go. I trimmed all the excess burlap, but an inch or so, around the chair bottom. 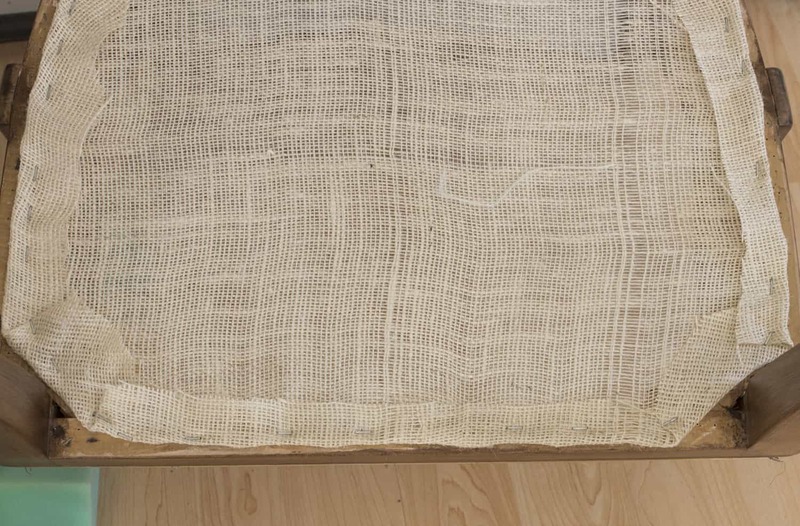 Then I folded the burlap back over the staples (toward the middle of the chair) and stapled it again. 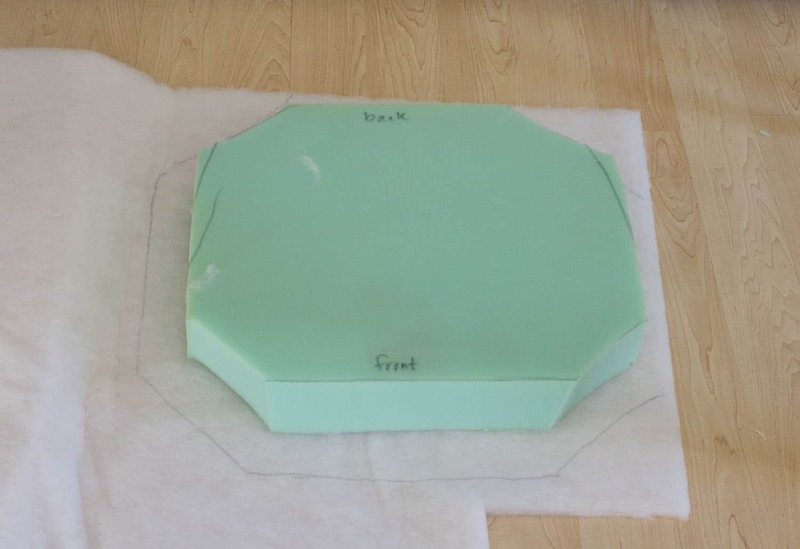 To make a pattern for the batting, I simply laid my foam insert on top of the batting and used a permanent marker to trace around the foam leaving several inches clearance from the edge of the foam. 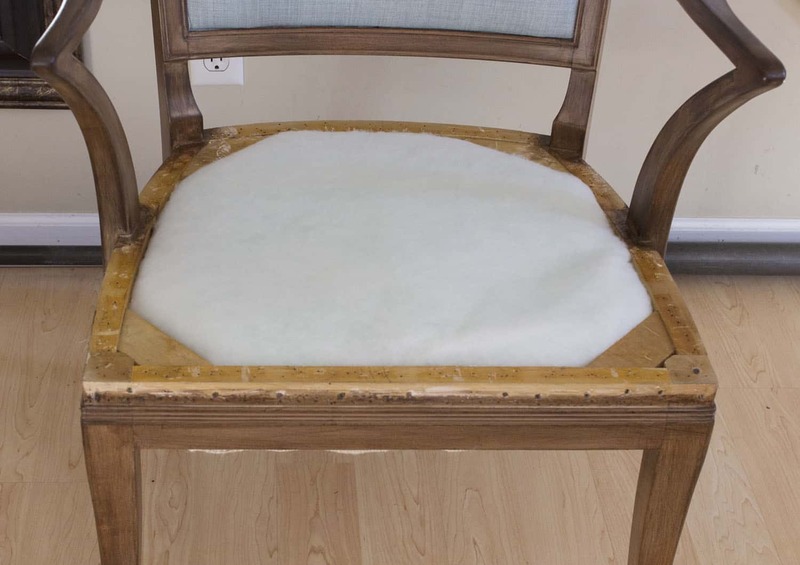 I wanted to maintain the rough shape of the foam, but the extra inches were needed to tuck around the foam, between the foam and the frame of the seat of the chair. Put the foam into the chair and tuck the batting around it. It is at this step I decided to fill in the small gap left between the back edge of the chair frame and the foam I originally cut. Based on how the chair was originally put together, I’m sure this gap was ok from a functional perspective, but I like everything to be as perfect as possible, so I filled this small gap with a scrap of foam. Next comes a tight weave of jute webbing. I attached this by securing the back side of the chair with four strips of webbing. Then I attached three strips of jute webbing to the left side of the chair. Then wove them together before fastening the opposite sides. 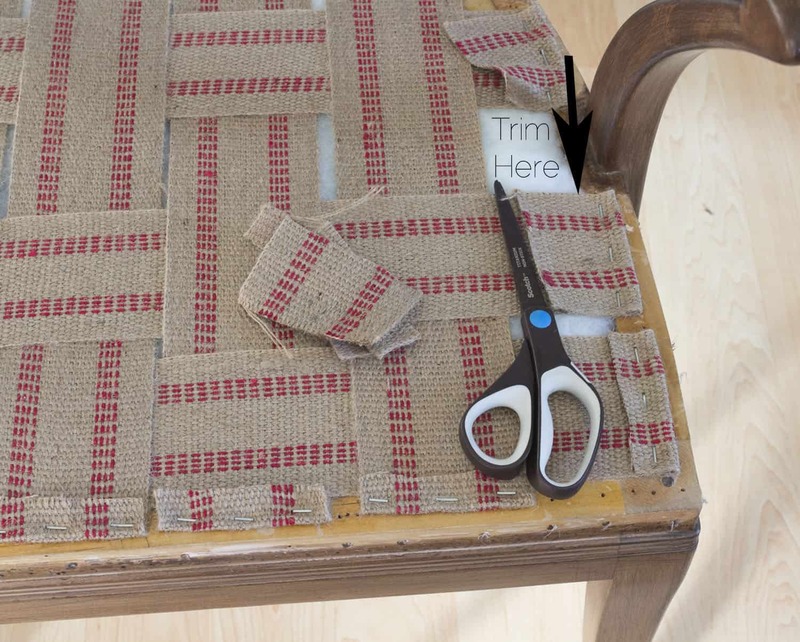 Attach the back and left side of the chair webbing and weave the ends together. First staple 5 staggered staples into each strip ( _ – _ – _ ) then fold the end back over the staggered staples and secure it with three more staples ( _ _ _ ). Have your super strong husband pull each piece taught while you staple 5 staples into the finishing end of the strip. Staple again in a staggered pattern ( _ – _ – _ ). 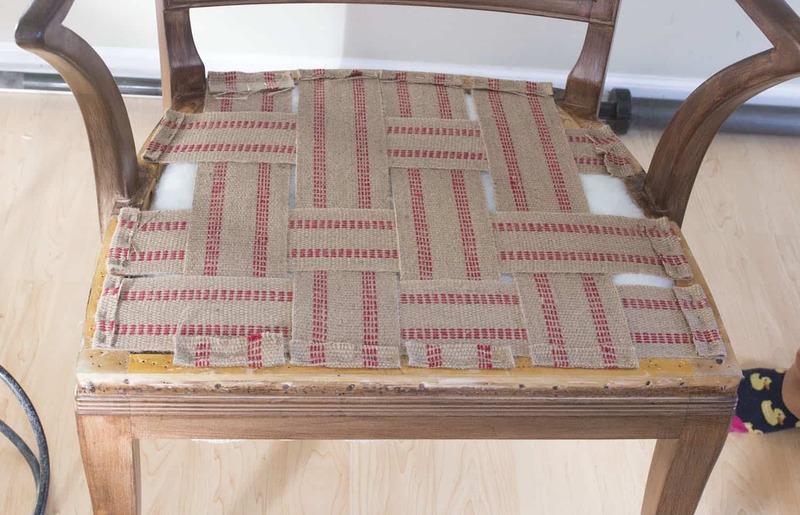 Repeat steps 2-3 until all jute webbing strips are taut and stapled to the chair. Fold over the ends of each strip and staple three more times ( _ _ _ ). Those jute strips are TIGHT. Both my husband and I sat on it, and it barely gives. Looking back at the old webbing when I stripped the chair, the webbing was loose and buckled. This should make the chair much more sturdy and comfortable! Since I’m not an upholstery expert, more of a learn-as-I-go kind of girl, why is the foam in the middle of the seat frame? Does the jute webbing defeat its purpose entirely? I couldn’t find a tutorial of my exact type of chair so I really don’t know the proper way to approach this upholstery project. Thoughts? I must confess that I cannot believe how quickly this portion of the chair came together. Why did I procrastinate this long? We’ve had this sturdy piece of furniture, that I really love, sitting useless, half-finished in our basement for so long! I’m so glad I took the plunge to finish it now! I can be brave, and you can too! 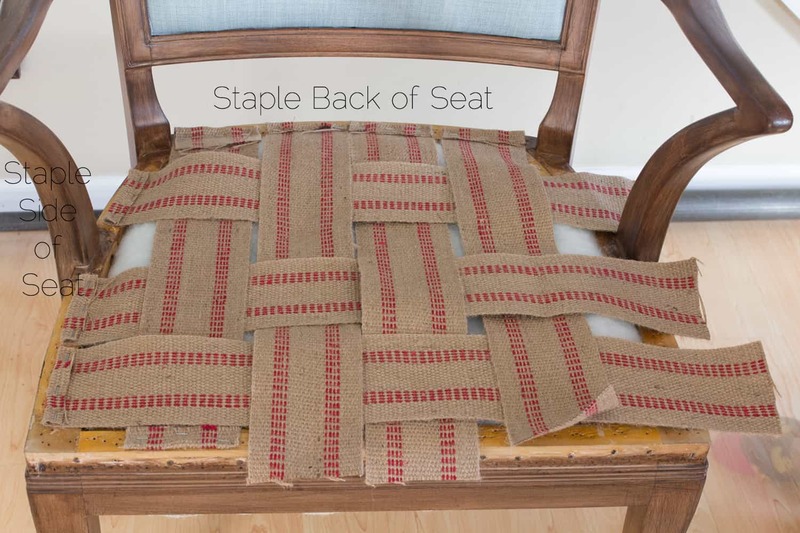 This completes the weight-bearing portions of the seat of the chair: burlap, foam, batting, and lastly the jute webbing. With a pneumatic stapler, this comes together very quickly! If I can do scary things you can too! Stop procrastinating and start doing! Up next: the soft and comfy part of the chair! What are you procrastinating on lately? What scares you about starting a project? Do you find those scary items are actually no big deal once you start to tackle the project?